Well, no gardening today, obviously. 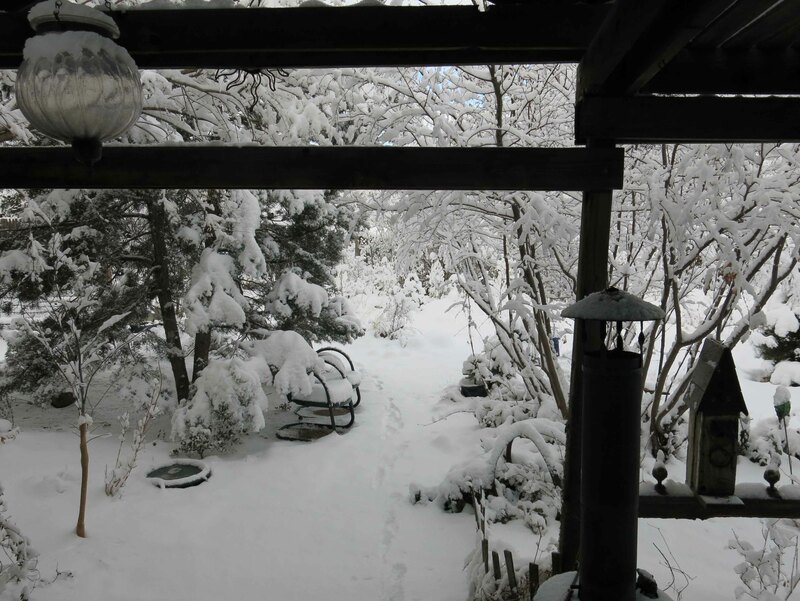 I had to set the alarm for the dog so he wouldn’t sleep in until 10:30 like he did yesterday, and woke up to a winter wonderland….. I’m not one of those people who thinks that snow on the garden in January is “moisture”. I just shoveled a whole bunch of moisture off the driveway; that was fun. The dog stayed inside and watched. 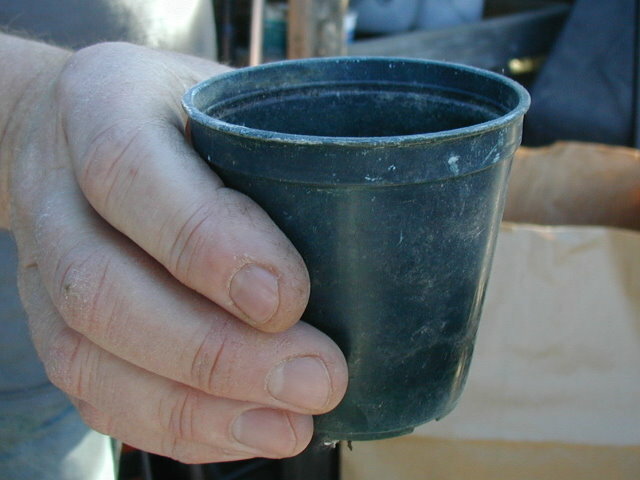 Most of the seed is sown in pots which are set outside, so that the seed can germinate on its own. This is called vernalization. I showed a picture of the (portable) seed frames here. 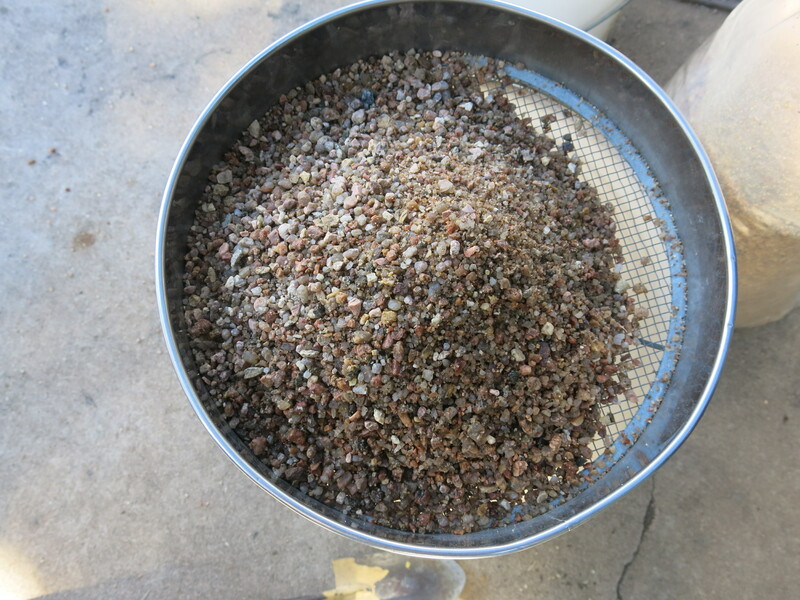 I spent some time screening squeegee the other day for the cactus seed. I guess this needs an explanation. squeegee; I don’t know why it’s called that. same stuff they spread on roads. it needs to be screened because some of the particles are too large. ideally, the particles should be the size of those in upper right, but I bet someone got lazy and let bigger ones, like lower left, get through. 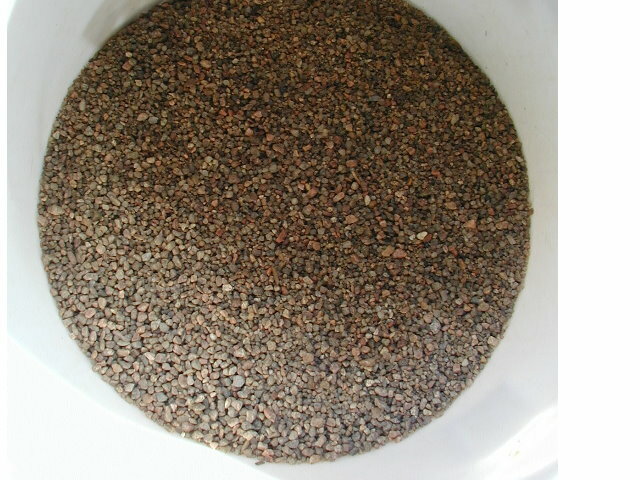 the seed mix, which varies, but usually equal parts screened peat moss, perlite, and sand, is moistened from below, then seeds sprinkled on top. 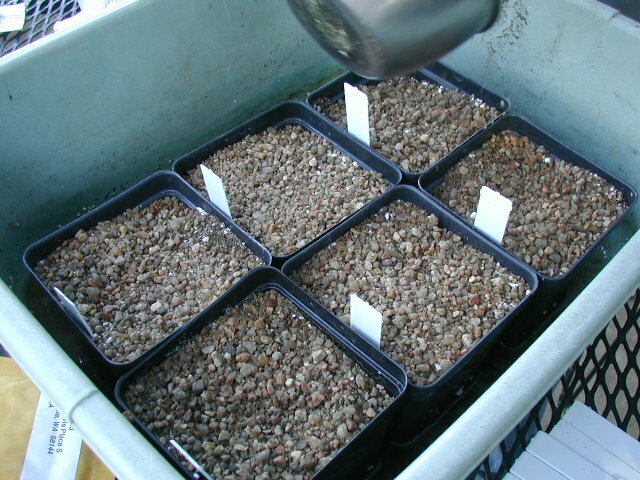 seeds visible in far right pot. topping of squeegee–about 1/16 of an inch–sprinkled on, pressed down lightly, and watered using a watering can with a fine rose. The other technique I use, sometimes, is stratification, which I talked about here and is a complete pain in the posterior, but sometimes there is no other choice. Apparently this is true for the seed of Ceanothus velutinus, which first needs its hard coat to be cracked in some way, then a period of stratification is required. In the wild the cracking is accomplished by fire. One of the ways suggested to crack the seed coat, aside from fire, is scarification, rubbing the seed on sandpaper until the endosperm is exposed. I’m not going to do this. 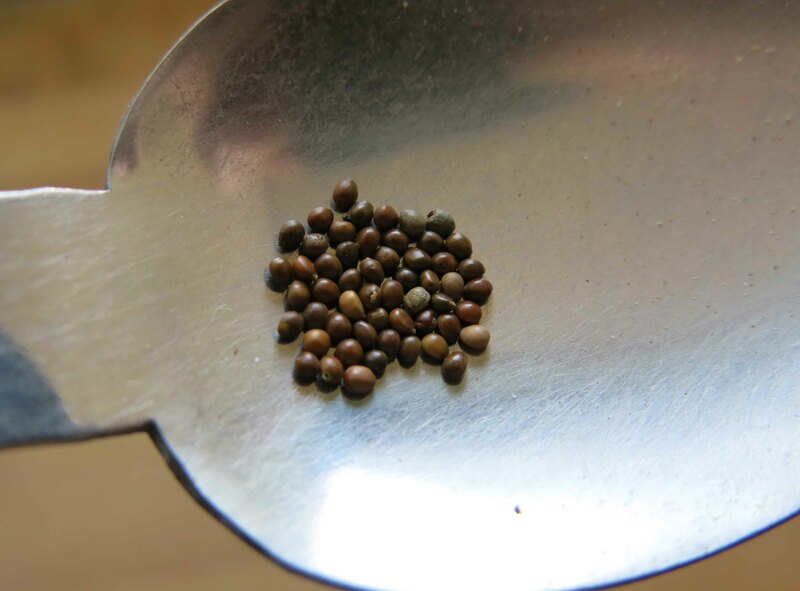 Cindy liked doing this; it was just the sort of microscopic work she enjoyed, but the last time I tried it the seed got crushed and flew all over the kitchen. People like me who are entering their Declining Years have no time for such nonsense. The Forest Service has a data sheet on Ceanothus velutinus which says temperatures of 176 to 203 degrees F. will break the seed coat, before stratifying the seed. It didn’t take me very long at all to realize that I knew exactly how to do this. The seed can be germinated by sowing it outdoors, too. The percentage of germination is very low. 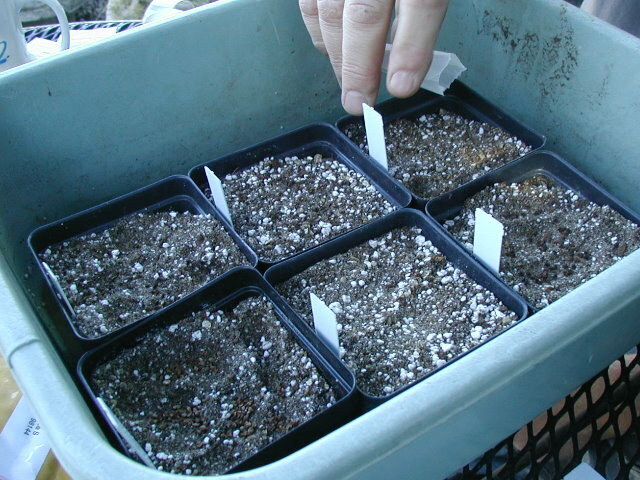 The outdoor method works for a number of species whose germination requirements are said to require heat from fire (like Romneya coulteri). The action of freezing and thawing does the work. I’ll report back on the toasting method in a couple of months. This entry was posted in Uncategorized and tagged ceanothus velutinus, scarification, stratification, vernalization. Bookmark the permalink. Thanks for amusing blogs, as always, sir! You can crack them, using the right kind of nutcracker, or pliers. I don’t recommend this, though. I’ve been using Utelite for a top dressing. I hate screening rock. Life is too short. Also, I resent seeds who need a warm period first, especially when I forget to just sow and set outdoors in the fall. Sometimes these plants are more trouble than the kids, and that’s saying something. 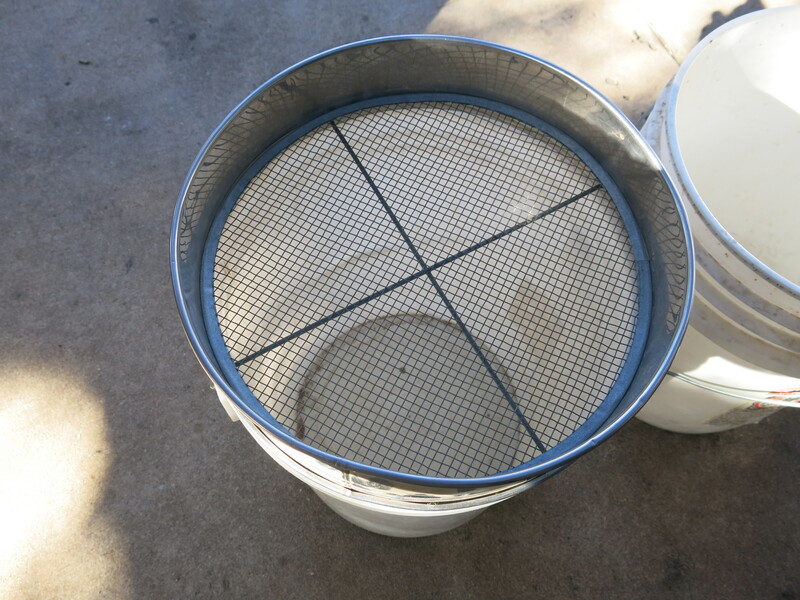 There is one benefit to squeegee screening; I use the larger particles to resurface troughs. Quite a few of the troughs here have sheets of styrofoam set diagonally so that the large rocks on top have something to perch on. The styrofoam gets exposed all the time, and doesn’t look so great. I’m salivating over those well-stocked spice shelves. Food is nice. The massive accumulation of spices was due to a constant demand for Indian food, mostly in the form of vegetables of one sort or another. “More vegetables!” she would shout, and at the end of a week or so of this vegetable love, toasting and grinding spices and chopping vegetables and frying dried hot red chilies in oil, coughing and cooking at the same time, there would be a tiny voice whispering in my ear, saying “Take me out for a hamburger”. I still do a lot of cooking. In fact, I made chicken with fenugreek about five days ago…frozen fenugreek leaves…and have been reeking of it ever since. Not a bad smell, like maple syrup really, but pervasive.